Hello, students. I’m Gordon Gardenvoice, and I’ll be leading your class today since your regular teacher is not feeling well and elected to take a sick day. Not only in size, but also in terms of physical strength, durability, longevity, beauty of form, utility of purpose—and the list goes on and on from root tips to treetops. Let’s take a look at these humble giants and then consider the generous list of gifts we receive from these noble beings. 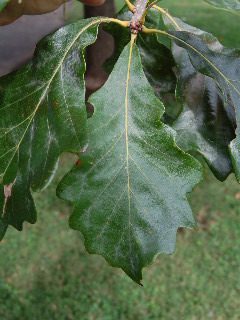 Hundreds of different oak species have been identified. The mighty oak can be found in both North and South America, Europe and Asia, and in many other parts of the world as well—generally in all but the coldest parts of the planet. Particularly in North America, the oaks are often grouped together into 2 large categories—those being the red oaks and the white oaks (with many species of oaks in each grouping). Here’s a little tip that’s generally helpful in distinguishing the white oaks from the red oaks when you encounter these mighty beings in the wild—look at the leaves. 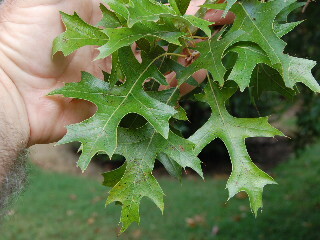 The red oak leaves have pointed lobes (see top left photo), and the white oak leaves have rounded lobes (see photo below). What do we get from the oaks, other than inspiration from their majestic beauty and strength in the Earth’s landscape? Well, for starters, how about some of the strongest and most beautiful furniture in the world? Many pieces of elegant furniture are made from oak that has been cut in a manner known as “quarter-sawn” which shows the interior “rays” of the wood grain. The great strength of oak is also often showcased in the exposed beams of building timbers in homes and other structures. Oak is used in making barrels for the aging of whiskeys and wines. See our Garden Tour article Jack Daniel's Distillery: Lynchburg, Tennessee. Also, the bark of certain oak trees is used in making corks. Squirrels and other animals of the forest forage for and dine on acorns—the seeds produced by the oak trees. Want more gifts from the oaks? How about the intangible wonder and goodness of a beautiful oak tree planted and growing as a shade tree in the park or even in the landscape at your own home? Doesn’t that make you feel all warm inside? If not, then you might try sitting by a toasty fire of glowing oak embers in your home fireplace as you contemplate the long list of great gifts the oak provides us! Thank you for being such a great group of students!